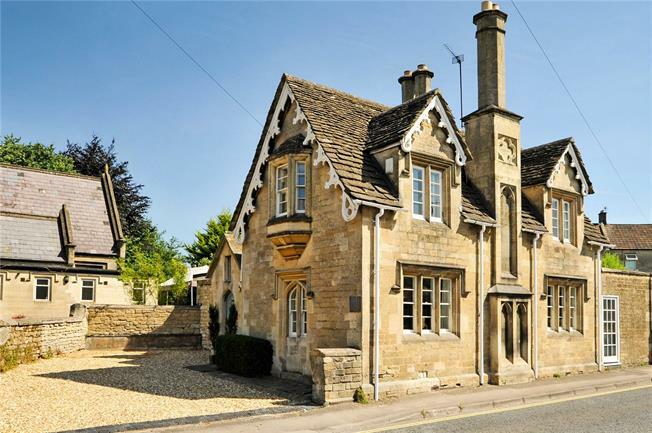 4 Bedroom Detached House For Sale in Bradford-on-Avon for Guide Price £695,000. This beautifully presented former head masters house is offered for sale having been carefully renovated and improved by the current owner. The Grade II Listed property makes an extremely comfortable home with a fine attention to the detail. The main hall opens to a quality fitted kitchen and the main double aspect sitting room. A door connects to the dining room with an enclosed staircase to the upper floor. From the dining room a pair of doors open to a guest bedroom with a door to the garden and a luxuriously appointed shower room. The kitchen has been well appointed with a contemporary finish having granite effect tops and bespoke cabinets. Inset ceramic hob, hood and oven, fridge freezer and an integrated dishwasher. Providing ample room for a table, a door leads out to the rear courtyard. There is a utility lobby fitted with a sink and a washing machine and gives access to a modern cloakroom and a study, with French windows to the side and floor to ceiling storage and boiler cupboard. The first floor offers three bedrooms, two of which are double aspect and an equally luxurious family bathroom with a Jacuzzi bath. Bradford on Avon is an historic Saxon market town with a number of local attractions including the Tithe Barn and wonderful walks along the canal. Shopping is a real treat as there is a wide variety of quality business’s that cater for day to day needs as well as luxury goods supplied by individual boutiques. There are plenty of restaurants and pubs to suit all tastes as well as traditional tea rooms. The town is also home to some of the most popular state schools including St Lawrence’s. There is a railway station with direct services to Bath and Bristol, linking to London Paddington. Excellent bus services are immediately had for local travel and further afield. The property is approached over an open gravelled parking area with space for a number of vehicles. To the rear is an enclosed storage/bin area. From the kitchen and guest bedroom suite lies a paved courtyard with steps leading up to a wonderfully stocked and carefully landscaped English Country garden. With a wide variety of specimen shrubs and trees including fruit trees and formal lawns lead to hidden seating areas for quiet relaxation. A large wooden shed and a further garden house are to the rear where the boundary abuts the Christ Church Primary School playing fields. Services: All mains connected. Council Tax Band E.